Poultry companies that spent decades breeding top-heavy birds to satisfy America’s craving for chicken breasts are hunting for solutions as consumers cluck for more dark meat. Demand for legs and thigh cuts is climbing as diners tire of white meat and TV cooking shows tout dark meat’s richer flavor and softer texture. Sales also are benefiting from growing exports to foreign markets that favor chicken on the bone, and from rising immigrant populations in the U.S..
Stronger demand is lifting prices for the formerly cut-rate meats and helping pull the poultry business out of a slump that led to hundreds of millions of dollars in losses and threw some small producers into bankruptcy. Last year, overall chicken prices fell to a two-year low on supply glut. They rebounded to a new high earlier this month. 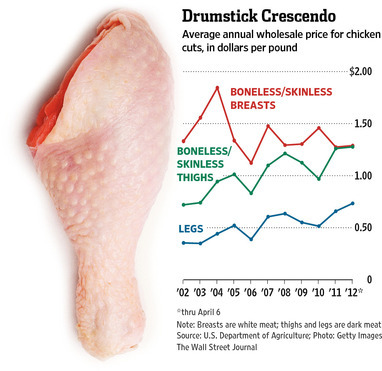 Whole Foods Market Inc. recently found itself wrestling with an unusual shortage of thighs. “In the past, it was always a struggle to get rid of the thigh meat,” said Theo Weening, the retailer’s global meat buyer. Bell & Evans Holding LLC, a Fredericksburg, Penn., poultry producer that raises 50 million birds a year, says its sales of dark meat to some grocery chains have surpassed those of white meat. Another customer, Chiptole Mexican Grill, the fast-growing restaurant chain, uses mostly dark meat in its menu, saying it is more flavorful. “Every single day we have shortage of dark meat. It’s getting worse every year,” said Scott Sechler, owner of Bell & Evans. “Customers started to realize that if you threw them on the grill, they’re a lot more flavorful” than other cuts.